Limited time offer, free shipping on all orders over $398 via UPS ground in the lower 48 states. Limited time offer, we pay the sales tax on all orders! Questions? Call 707-998-0135 or email info@AirKayaks.com. Domestic U.S. Shipping: Shipping is normally via UPS Ground Insured within the lower 48 states, and via USPS to Hawaii, Alaska, Puerto Rico, protectorates and APO/FPO addresses. To ascertain shipping costs, simply place items in the shopping cart and then select the Estimate Shipping button. Enter shipping details and you will see a list of shipping options and prices. You can add/subtract items and recalculate. Limited time offer, free shipping on all orders over $398 via UPS ground in the lower 48 states. 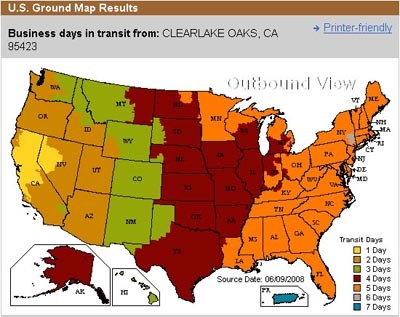 See the UPS ground shipping map for typical transit times. Sales Tax: Shipments made within California are subject to 8.25% California State Tax. Limited time offer, we pay the sales tax! Returns and Defective Merchandise: While it rarely happens, if you receive merchandise that is defective, please contact us via email or by calling 707-998-0135. If contacting via email, it is helpful to send a photo of the problem along with your name, phone number and shipping information.